This page assumes you have an existing Movie, TV Show and/or Music Video library. If you do not have an existing video library, you will need to create one by following the Create Video Library guide. If you use File View or File Manager, this page does not apply. The Event Log will record any files missed when an Update Library is performed. If the log is currently empty, or lists no missing movies, TV Shows or episodes, then perform an Update Library and check the Event Log again. The following methods are available to scan folders and locate new titles to add to the Library. They can be performed on the entire library, a particular Source, or an individual title. If you use NFO Files, new titles will be added to the library. If you have changed the information inside a NFO File for an existing title in the library, this section will not update the library with those changes. You will need to perform one of the Refresh Library methods detailed in Section 4 below. By enabling the setting 'Update library on startup' the library will be scanned for new content each time Kodi is started. If you do not add new titles to your library very often, you should disable this setting and use one of the other methods when new titles are added. Add-on:XBMC Library Auto Update can be used to schedule automatic updates to the library. Add-on:Library watchdog can be used to watch folders for new files to trigger library updates. 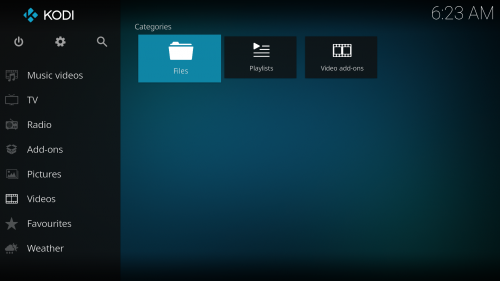 When Kodi performs an Update Library it scans each Source, and each file and folder in the Source, searching for new items. For larger libraries this can be quite a lengthy and unnecessary process. It is possible to reduce the duration of this process by scanning a single source only. Kodi will scan the selected Source for new content. To scan a single title into the library, follow these steps. These methods will not work in the following situations as they are seen as new titles. The name of the video file or folder has changed. Use one of the Add To Library options above. Use this procedure if there are multiple changes to be added to the library for existing library titles. The entries will be removed from the library. 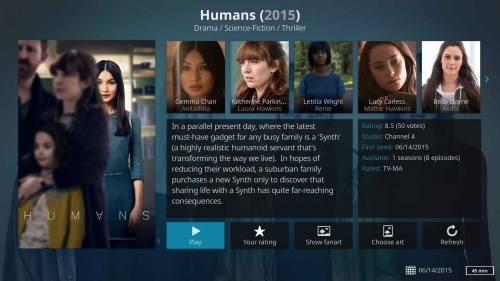 Kodi will scan the Source and scrape the videos with the new information. It is also possible to Refresh the Source by changing the Scraper in use. For example, you may want to change the Information Provider from TheMovieDB to, say, IMDB. 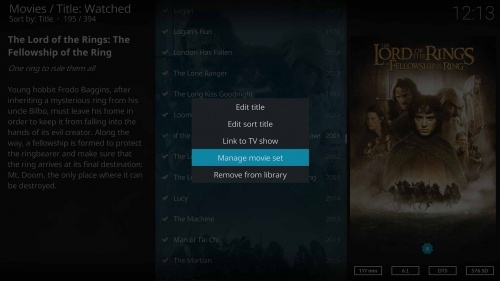 Kodi will ask Do you want to refresh information for all items within this path? . If you do not want to create a new Source, then follow the above steps but navigate to the actual video and Set Content on that video folder, not the Source folder. Refreshing/updating an individual title can be performed from either File View or Library View. Navigate to the title to be updated/refreshed. This will update the library data with the new information. To remove existing titles from your library, use one of the following solutions. If you selected Yes you will then be asked Do you want to remove all items within this path from your library? No- Will keep the library listing of all video titles that are in that source. The source will be removed from File View, but not Library View and all titles will remain. Now repeat these instructions from Step 1 ensuring in Step 6 you select Yes to the question Do you want to remove all items within this path from your library? If you would also like the file deleted from your hard drive, ensure the setting Allow file renaming and deletion is enabled. Be aware that the deletion setting will only delete the video file. Any artwork, nfo files, trailers, extras, movie folder etc, will not be deleted from the hard disk. It is possible to exclude a particular video type (eg. mkv) or a folder from the Video Scraping process. With the use of the advancedsettings.xml file, you can limit the types of video files displayed. The process can also be used to include additional file types. A list of additional file-extensions to allow (add) or exclude (remove) in the My Video windows. Create an empty text file. Rename the text file to the above name with the leading and trailing period. Windows will notify you that changing the file extension will make the file unuseable. Accept this.